Wine labels convey a wealth of information and they come in so many styles, they defy categorization. They can be staid and dignified, playful and fun and occasionally downright bizarre. For Instance, have you tried Cat’s Pee on a Gooseberry Bush? Doesn’t that sound appetizing. Let’s pair that with a nice fillet of road kill for a delectable “treat”. 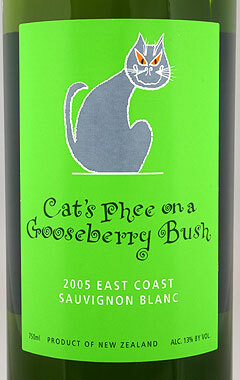 Seriously… Cat’s Pee On A Goosberry Bush? There’s actually a story behind this saying (if you are interested, visit our blog post, the Top 5 Wines That Should Never Be Given as Gifts but it takes a big old set of brass balls to actually name your own wine Cat’s Pee On A Gooseberry Bush. The wine label is the only spot on the bottle where the winery can market their wares and some marketers take creative license to the extreme. Every once in a while, we come across an article or have a conversation that begs some questions about the type of information on wine labels. We also get questions on restrictions about wine labels. Aside from the wine name, there tends to be a lot of other information on a wine label. New World Varietal wines indicate the type of Varietal while Old World wines often put more emphasis on the region and the Appellation from where the wines come. Because US wines can’t use Old World geographic names like Bordeaux, Burgundy, Champagne or Chianti, we usually default to the Varietal type or a clever name for blends for descriptions of what’s in the bottle. The Vintage year indicates what year the grapes were harvested and requires. There is lots of information on a wine label if you know what you are looking for. We’ll be adding to the posts below as we get questions or come across intriguing posts so feel free to send us a question if you want to know what a label means. Our first post was triggered by a discussion about what “Old Vine” really means when you see it on a label. If you’re curious about what constitutes an Old Vine wine, check out that post. Our latest foray into wine labeling was triggered by an email that we got from the Sonoma County Vintners, a Wine Association that represents hundreds growers and wine makers. They have chosen an interesting (and quite savvy) tactic in changing how their wine makers label the AVA from which the wines come. Smell and taste it's all I was thincking at first.